Hidden New Jersey: Stevie Nicks, get out of my head! I've finally relented to the madness of listing all of the species I've seen since Ivan and I started birding together. Add to that the few notables I recall from my other travels, and I've collected a roster of about 150 birds, give or take. Thus, when Ivan suggested that we drive to Cape May last Saturday, I was a bit more than receptive. He'd heard that two doves, the Eurasian Collared and the White-winged, were cited at the point, and if he needed them for his lists, I certainly could do with seeing them, too. Doves, for the uninitiated, aren't just the cooing white creatures we see at weddings and in magic shows. Most are kinda pigeon-y in color and size, but they're more distinctive than the average sidewalk denizen. You've seen 'em. You probably just didn't realize it. I have to admit that I'm not a big fan of getting up early enough to hit the Parkway at 6 a.m., even if someone else is driving. It still frustrates me that my favorite Parkway rest stop, Ocean View (milepost 15 or so) now lacks a staffed food source AND doesn't open until 8:30 a.m. I mean, where am I supposed to get my burger and duck into a rest room? Governor Christie, are you listening? That rant aside, and needing the facilities, we made a beeline for Cape May Point and the state beach, figuring we'd then stop for a convenience-store bite and locate the doves next. Fortunately the rest rooms near the lighthouse were open and the 7-Eleven offered up prepared breakfast sandwiches. A helpful note here: avoid the pork roll and cheese on potato roll. It's both a belly bomb and potentially trichinosis-laden, if you catch my drift. Cape May Point offers acres and acres of protected habitat, but the two doves were said to be hanging out at specific residential addresses, so we went to check those roads, scanning the utility wires along the way. We checked for the white winged dove with no luck, running into a couple of birders Ivan knew, who also hadn't seen the bird. 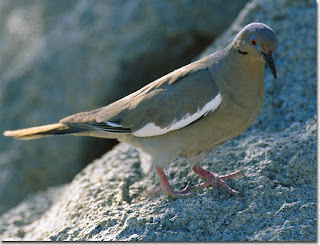 but a white winged dove, nonetheless. Next stop, collared dove. The neighborhood there was a little denser and closer to the beach, and the dove's address led us to a corner property ringed with evergreens and a nice enclave of bird feeders. Shortly after we got there, we were joined by that first pair of birders and another trio, all scanning for a bird which seemed not to want to be seen. The chat was friendly and optimistic, making the wait and the additional scans rather pleasant. Someone decided to check out the trees on the other street bordering the property, and I ambled over to see if I could find anything. With that many more experienced birders present, I didn't expect to be the one to spot it, but... I was! Nestled back in an evergreen, like one of those glass Christmas tree bird ornaments, was the visitor we'd all come to see, the Eurasian collared dove. He very nicely accommodated us with some good views, turning from time to time to allow us to see different aspects. Before we parted company, we exchanged numbers with one of the other birders, who pledged to let us know if she saw or heard about any other good feathered visitors. With that victory in hand, we drove back over to see if our luck would continue with another visit to the white winged's reported spot. This time, the property owner, himself an avid birder, suggested we could come into his yard for a look. He also told us the dove had been showing up around 3 p.m. for the past several days. Great! If we could just get all the birds on regular schedules, all of this listing folly would be so much easier. We had a few hours to kill before then, so we headed back to the lighthouse to check out the ducks on the nearby pond. Given the time of year, the duck population is increasing both in volume and variety, making it more likely we'd find something interesting at the blind. At the very least, I might get one or two new species for the list. It didn't take long for us both to make good sightings. As I was scribbling "coot" into my listing book, Ivan called a male Eurasian wigeon. It differs from its American cousin in the color of its head (the local guy has a green cap of sorts while the import is more brownish in the same spot) and underbelly, while the females of either species are pretty similar, making ID difficult. Several birders happened by and crowded into the blind to get Ivan's description of the bird's location on the pond among so many waterfowl there. Unlike the frustrating chases of weekends past, we were really cleaning up on listing birds, but the last quarry, the white-winged dove, was yet to be seen. We optimistically headed back to the proper address, and a few yards before we got there, noticed yet another birder trained on a tree in a field. To the naked eye, it appeared he was staring at an oddly grown branch. A closer look revealed the growth to be an immature bald eagle, just hanging out. Eagles are becoming more common, though it's always a thrill to see one, especially a young guy who looks strong and healthy. It crossed my mind that he was frustratingly close to the white-winged's habitual afternoon spot. Hopefully we'd spot the dove before the eagle did. Not to worry. As we pulled up to the proper address, the property owner was walking down his porch to the driveway, camera in hand. No doubt the visitor had arrived! A small crowd gathered as we put binoculars to eyes and looked upward into a nearby tree. After a few moments of looking, someone found the white-winged dove and began describing his whereabouts so the rest of us could find him. Yup, there he was, patiently nestled on a branch, displaying the distinctive white stripe on the edge of his wing. Nice! Thanking the property owner for sharing the view with us, I asked, "What're you going to have for us next week?" I was kidding, of course, but I guess you could say I caught the bug. A successful day will do that, I guess. It wasn't just the birds, though. As Ivan mentioned later on, one of the great parts of birding is the sense of community, and Cape May was birder central that day. Almost from the moment we got there, we'd run into others who were capitalizing on the great weather to visit with the birds, and all were more than happy to share their finds and hear about our discoveries. You can't help but feel good about that.